Have you ever combined rolled oats,almonds and sesame for making quick laddoos with powdered jaggery, if not you guys have to give a try to this incredible addictive laddoos. When Kalyani announced sesame and jaggery for this month's Magic Mingle,the first thing came to mind is laddoos, immediately i prepared this irresistible droolworthy laddoos yesterday. These laddoos gets ready very much quickly and easily with less ingredients, this yummy laddoos suits prefect to serve when you have sudden guests at home too. As i used oats, sesame and almonds, this cute laddoos are definitely super healthy.Sending to my own event Healthy Diet-Cooking with Wholegrains guest hosted by Jaya. Dry roast the rolled oats until a nice aroma comes out,keep aside. Dry roast the sesame seeds until a nice aroma comes out. Dry roast the almonds for few minutes. Take the roasted almonds, oats, sesame seeds with powdered jaggery,cardamom in a mixie jar, grind everything well as fine powder or bit coarse powder. Transfer it in a plate. Gradually add the melted ghee to the grounded powder and make as medium sized balls. Conserve it in an air tightened box and enjoy. Very creative recipe! Feel like preparing them now :). THe ingredients are so nutritious that I just fell for these Laddoos! Wonderful recipe priya, looks yum! wow these look so yumm..definitely will try them, thanks for sharing the recipe.. Healthy yummy and delicious laddus. awesome recipe. love the addition of oats in this. 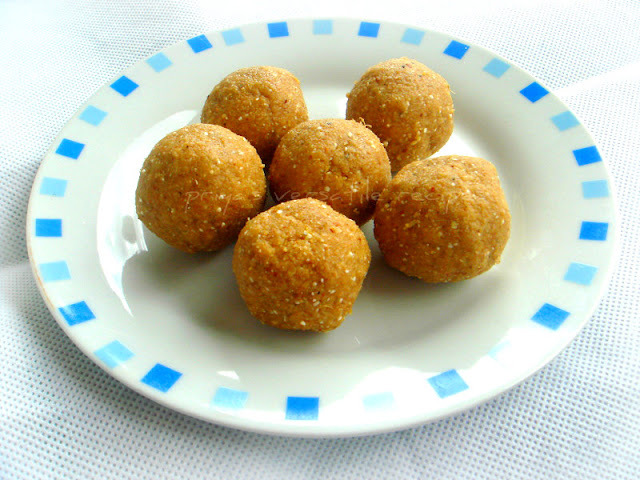 So healthy and tasty..looks yum..
wow wonderful and healthy laddoo..looks very tempting!!! have to try this..looks delicious..
very tasty and healthy ladoos. A nice twist to the sesame ladoo. They look the melt in the mouth kind and not the chewy ones. These will melt in my mouth eaisly. Awesome work Priya. So innovative, you are so fast and quick in posting it.. awesome! Yummy ladoo and pic looks so beautiful and tempting !! Oops..pass me the plate dear. Healthy and tempting ladoos...looks inviting dear. Delicious and healthy ladoo priya. C'est en anglais, je ne comprends rien! i like laddoos very much...tempting mouthwatering..i dont know how to control my feelings after seeing ur oats ladoo..
Fabulous ladoo I am going to make this tomorrow itself.Thanks in advance. Good ladoos Priya. It has been quiet a lot of time since I had any ladoos. My gym master says they add fat to the physique.